1 - Is Mautic the Right Choice? ​1.2 - Self Hosted or Cloud? ​2.6 - How Does Profiling Work? 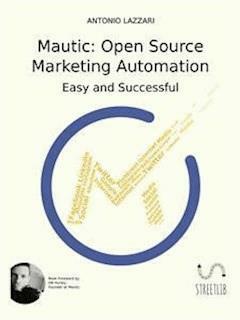 Mautic: Open Source Marketing Automation. Easy and Successful. I began writing this book for myself. The currently available Mautic manual is limited, so I wrote down my ideas to fill in the holes, and add to the material for my courses. This book aims to explain how to create a Marketing Automation (MA) strategy with Mautic. My clients are young entrepreneurs, startuppers, and freelancers. I wrote this book having them in mind. It is structured like a journey into a marketing strategy for small- and medium-sized businesses. Mautic is the vehicle on this special journey. This book simply outlines the path of the work that you should be doing in your own business starting today. It will help you understand what you need, how to organize your work, how to plan a strategy and carry it out, and how to analyze your outcomes in order to improve and reap the rewards. Marketing is not an exact science. It is based on sociological and psychological norms, as well as on intuitions about the functioning of social networks’ and Google’s algorithms. All of these aspects are only partially grasped. Nobody can guarantee firm results. Beware of whom makes such a promise! The only person who can guarantee firm results is you, with your work, your trial-and-errors, and your successes. Give it try, over and over again. Results will come. Forget about easy paths. They simply do not exist (although strokes of luck do rarely happen). This book will be available through all major distributors, however I decided to settle for self-publishing in order to guarantee a fair price. You will not pay money for editors, publishers and advertisement: only for real content. StreetLib.com is the tool I chose to write and publish this book. A paper version is available on a print-on-demand basis. This implies slightly longer times for delivery. Just a little patience: by printing only actually sold books, we can greatly reduce our impact on the environment. I chose Mautic as my work platform, and I decided to write an operating manual to unfold its potential. Open Source tools grant you freedom and ownership of data. When erected on a sound development basis, they can also reach excellent quality levels. In my opinion, Mautic represents all of these characteristics. It also offers several free options. With Mautic the freedom to choose is in your hands. A heartfelt thank you to my wife Simona and my daughters, for putting up with my follies patiently every day. Thanks to Fornace Studio (Verona, Italy) for sponsoring the English edition of this book. A special thanks to you, who decided to buy and read this book. I hope we will meet someday, at least online. I’ve always been in awe to see the the constant and growing excitement surrounding Mautic and the open source marketing automation movement. When I first founded Mautic was eager to share the software with the world, but I was far more eager to share the philosophy and thinking which compelled me to create the product in the first place! The ethos of community, the value of others, and the empowerment of people around the globe. I believed we could create a culture and a community around this shared vision. I believed in time we would be able to change our world for the better through the tool of open source marketing automation. I never imagined how quickly people would understand and relate to this thinking. And I am still amazed at the growth we continue to experience as new people discover Mautic! Every time a new community member joins Mautic they are encouraged to find ways in which they can become a part of the culture. Each person has unique skills and talents and with Mautic they are empowered to be a part of something greater than themselves. Some offer smaller yet consistent contributions while others work tirelessly on large and notable contributions. Whenever a community volunteer, such as Antonio, dedicates countless hours of his personal time creating a resource like this book I’m truly speechless. It is this dedication, this level of passion which pushes us far into the future. If you’re looking for a Mautic resource to have close at hand as you learn the product and explore the concepts of open source marketing automation I can think of no other resource as helpful as the content you’ll find in the following pages. Our analysis shows your website is ranking poorly on Google. Thanks to this book, in a few weeks your website will be listed at the top. You will sell more, and sit back while you live off your revenue. Would you like to enjoy your time, your family, your hobbies, travel more? This book is the amazing solution to all your problems. Do not wait too long! It will soon be off the market, before too many people discover its incredible secrets. Have you ever been tempted to reply? If you ditched those messages, this book is for you. This book is a journey into the Open Marketing, that is to say Marketing Automation (MA) done with Open Source tools. We will discuss techniques and marketing strategies, and how to put them into practice with Mautic, one of the best Marketing Automation platforms available today. We will also address how to improve your Content Marketing approach. Social Marketing and new business models. What Mautic can do. Main functions explained step by step. How Mautic can serve your strategy. Why you need a Marketing Automation platform. Why you should choose Open Marketing. 1. Before analyzing the software, I decided to devote a chapter to understanding the main marketing strategies and innovations that are slowly reshaping classic market rules. By social marketing I do not refer to the social media element of marketing, such as social network advertising and communication strategies. Those are simply advertising and communication tools, and do not account for social marketing. I will also teach you basic techniques to implement a marketing strategy by making my toolbox available to you. Step by step, chapter by chapter, you will learn how to practically start and develop your own strategy. 2, 3. Once we we have covered the main Social Marketing issues and strategies, you can begin exploring the software. I will outline Mautic’s key features and functions, and how to make the best out of it. This book wants to be a sort of applied strategy handbook, rather than a software set up guide. Therefore, rather than a manual about Mautic, you will find yourself with a handbook for implementing Marketing Automation strategies through Mautic. A complete marketing strategy. A marketing plan based on your own specific needs. A complete Marketing Automation platform ready to work in unison with your web site. A complete Automation action set. Plenty of competences. Before choosing which platform works best for you I suggest you read Chapter 2. While deciding, keep in mind one of Mautic’s strongest aspects: no other MA software is both open source and allows you to export the history and results of your campaigns. Most platforms bind you for life. If you decide to switch to another platform, you will lose your data. The longer you use a platform, the harder switching gets, and you will end up at the mercy of their pricing policies. The basic know-how this book offers will still work on any platform. At the end of the book, you will be free to choose any software other than Mautic, with no waste of money or time. I have a feeling, however, you probably stick with Mautic, because you will also fall in love with Open Marketing. 4. Why do you need a Marketing Automation platform? This is an easy question to answer. Would you like to send emails to a potential customer, advertising the contents she needs at the times she needs them? If your answer is “yes”, there is nothing more to say. Marketing Automation’s task is customer profiling. It interprets the customer’s intentions, offers a range of specific actions and serves them to the customer at the right time. Needless to say, it does it automatically. Think of MA as a sort of co-pilot. You plan a strategy, she implements it delivering results for you. I only offer two kinds of services: furnace and water heater maintenance, and home security alarm systems installation. I only send emails to advertise my services. I exclusively send emails to my customers. One email every three or four months is more than enough. So few points, so many mistakes! Number of customers / number of services. If you spend thousands of dollars to subscribe to a Marketing Automation platform just to earn a few hundred in return, it is obviously more toil than profit. But Mautic’s free features can be just as good, and require no advanced technical competences. Moreover, you might desire more customers for your business. Creating a pool of potential customers who gradually get closer to buying your services would be greatly beneficial in order to flesh out your returning customers’ list. Resting assured is hard without a constant growth of the number of your potential customers. Finally, a limited number of services does not mean it is easy to successfully advertise them. Sending out self-referential emails publicizing what you do is the worst marketing choice you can make. In a nutshell, you would be adopting the same strategy call centers do, with one difference: you do not have a call center’s numbers or resources. Contents make all the difference. Be useful to your reader, do not annoy her with your ads. Why would a small business not need Automation? Sending out market news to interested customers is already important enough. True, you can always send emails manually to all of your customers. Later on you can call them one by one to collect their feedback, find out if they read them, whether your emails sparked their interest, if they qualify by law, then write down the names of those who respond positively, send them a quote, call back again to see who wants to follow through, and so on. What if, instead, you could do all this the first time, then have someone monitor your customers’ behavior later on? An assistant deciding which emails to send, to whom, and how to draft them in order to match each individual expectation? Someone who would send out quotes exclusively to interested parties? It would turn out much more impactful, and save you a lot of time. Let us take into consideration time alone. Imagine you want to advertise a new deal for a half off premium furnace. If you do not profile your customers, you will end up sending out the same offer to everyone, including those who just bought an older model for twice the price from you. It would not make a good impression, and you would risk undermining your reputation. Therefore, you have to profile. Since you do not have a lot of customers, you can manage sending an email manually only to those you think will need a new furnace. Imagine the time you will waste drafting customized emails, as well as searching your clients’ list, picking out who to write to. Should you just prepare one impersonal email body for all? And maybe send it out listing everyone’s address in BCC (or worse, in CC)? How would your customer react? Can you always find the time to write individualized emails? Think about it. This is the kind of communication call centers employ. Have you ever verified with your customers what kind of impression your emails leave? You do not have to choose between spamming and an impossible workload. Profiling is used to understand who needs what, and when. By profiling, you walk side by side with your customer. Instead of making her feel left alone, she will grow “brand awareness”, loyalty for your services and product. Finally, profiling is a quantitative and objective method that keeps track of customers’ needs, instead of relying on foggy memories of half commitments such as “I remember Mr. Smith telling me once he needed something...”. How frequent should your emails be sent? Even a single email advertising a product that was recently bought would be considered spam. On the other hand, frequent emails announcing a product the recipient is looking to buy could actually be positively received (if they are properly composed). This is to say, on the one hand the content truly makes all the difference between spam emails and valuable emails. On the other hand, the purchasing stage of your customer determines whether they view emails as being sent too frequently. Deciding beforehand that three or four emails a year are the ideal number for everyone at every time is a critical mistake. Unfortunately, it is a very common one. In particular, when the email adverting service for your business is set up by a technician with little or no marketing competences. I have one last doubt in mind: are you sure three or four emails a year are what you need for a customer to keep your services in mind? What if she decides she wants to install an alarm system but she only thinks you install furnaces? My small business owner friend, indeed, seldom sells both products to the same people. Is this just a coincidence? You do not really know how your customer thinks. Mentioning that you also install alarm systems while you are fixing her furnace might not allow the information to stick for long. Do not be afraid to send too many emails. Fear sending useless emails. 5. What is Open Marketing? Open Source Marketing automations enable you to market faster, market smarter and market for less. Modern marketers recognize that automation is simply not enough. To provide the most relevant value to the right prospects 2 & customers at every stage of the lifecycle, a new approach is needed. Open Marketing goes beyond just automation, effectively communicating with systems across the entire customer ecosystem and across your marketing stack. Mautic is an Open Marketing software platform that provides you with the greatest level of integration and deep audience intelligence, enabling you to make more meaningful customer connections. Only with Open Marketing can you fully own the results of years of your work. This is the main reason why I chose Open Marketing. Moreover, Mautic is the only software providing multiple interaction tools without binding you to its platform. Mautic is Open Source. Its code is free and amendable. It is the only software that allows you to customize solutions to customized problems. Indeed, it truly develops through its users feedback. Do you have a specific request? Get online and ask for it to be implemented. The more votes it gets, the more it will climb Mautic’s developers list of priorities. No other software entrusts its users with such power. What if no one shares your need, but it is still vital for your business? You can always pay a developer to customize it for you, as Mautic’s code is open and free. Who knows, you might even be able to sell your new feature to someone who shares your needs. Here is one last element too often overlooked. We can rarely be sure what companies that own Marketing Automation platforms do with our data. As a marketing professional, I cannot guarantee what third party companies will do. There is some concern about this. It is not merely a matter of ethics, but also of upholding current data protection laws. Marketing Automation (MA) platforms are numerous and growing. Everyone working in marketing, especially strategists, are convinced of their significance. The market offers an abundance of different versions and solutions. I want to tailor my analysis to small- and medium-sized businesses, for whom I feel Marketing Automation could represent an invaluable professional support. Large companies can afford entire marketing departments, including Marketing Automation experts and allocated resources. Businesses with limited resources or lacking marketing expertise, instead, can find themselves quite lost. I hope this book will help you clear your head and improve the quality of your business. How to choose your software? The Marketing Automation market offers everything from nearly-free softwares to platforms that cost tens of thousands of dollars a month. They all promise to boost your business by two to three digit percentages: “your turnover will grow by 75%”, “you will develop 250% new contacts”. However, here comes the reality check, where you begin asking yourself some questions. If those numbers are real, why is MA not universally employed? Is installing the software enough? What then? The MA software competition is so high, it is easy to end up in the clutches of the most aggressive players. You can end up swamped by emails, phone calls, and e-books you will never read. They will send you material written in impossible jargon, free skype and youtube courses where the only thing you learn is that you are not learning anything, unless you buy their product. Is it even possible to believe that one course is all you need to triple your turnover? This is one of the questions I ask myself when I read the business proposals some of these companies circulate. It is also one of the reasons why I decided to write this book. The next two Chapters are meant to help you understand if Mautic is what you need. You will also be able to consider what this book can teach you. I will never promise you will become rich and never fail a marketing strategy again. If you think I do, it is your right to ask for a refund for this book. I will also refrain from using specialized language, and the marketer technobabble where possible. My goal is to provide you with the techniques you need to build a strategy in order to secure useful information, optimize processes and correct your mistakes. It is a complete platform, with a solid development base and a rich community around it.It is one of the few platforms available on the market to allow a complete database export, including all your years of profiling work. The data you collect are surely yours, always.It grows fast, especially responding to its users’ feedback.It offers diversified solutions to different needs.It is Open Source. Its facts and figures are still sparse.If you are not willing to spend some time on it, it will not do anything by itself. But this is true for its competitors as well. There is not much more to say about Mautic’s weaknesses. Let us delve, instead, into its strengths. We are proud of what we have created in our product and we believe you should take pride in your participation. Our community is the uniquely powerful factor that makes this project so exciting and you are the ones to thank! At that time it was barely usable. It was promising, but only the brave could use the platform to its full potential. I began using it out of curiosity, attracted in particular by the active and sound community revolving around it. I now realize I might have been one of the first users in Italy, maybe in the world. Mautic quickly grew into an incredibly powerful tool, surpassing its competitors and closing in on the most blazoned platforms on the market. 2018 began with a good deal of bug-fixing work that already improved Mautic’s quality. Concurrently, a great development project for a 3.0 version has taken off, and might be the real news of 2019. Mautic now offers all of the functions that distinguish a Marketing Automation platform with very few or no competitors outdoing it. As a matter of fact, it exceeds most of the market’s well known brands’ performances. 2. You Own Your Data. Depending on the chosen solution, Mautic is one of the very few platforms that allow you to integrally export your entire database. Keep in mind I am not talking about your users’ list with their personal records. I am referring to all your profiling work, sent emails, users’ behaviors records on your website, their scoring, and so on. Practically all your work. It does not matter if you choose the Self Hosted or the Cloud solutions. With Mautic you will always be able to switch platforms with little or no difficulty. Other platforms only allow you to export the users’ personal records, sometimes not even completely. In addition, only with Mautic can you be absolutely sure of how the platform uses your own data. There is no guarantee with other softwares. Considering profiling is the highest value for these platforms, you might be giving away your value and paying for it. It is as if you paid twice for their service. I was always critical about this data usage policy. Mautic’s development model is typical among Open Source models. It is based on users’ requests while a software development company assures the process’ continuity and stability behind the community. Mautic’s learning curve is exceptionally fast, especially when compared to major market share competitors. That is where the community makes a difference, and not a small one. Its development rate has attracted web giants’ attention, so Mautic’s future is likely to take an interesting route worth observing. Its development curve is also surprisingly constant, with very frequent releases aimed to both adding new features, and improving stability. Mautic’s challenge was launched by one of Joomla’s core developers, David Hurley. It aims to be the first Open Marketing community and platform in the world. I believe it already met its goal. Mautic’s first solution is a Cloud version that comes installed by the mautic.com team. It is always optimized and configured to perform at its best. It is complete and unlimited, and it includes a support service. This option is subscription based only, and it includes a training pathway. The second solution was created in order to attract a wider audience towards the platform. It is still a Cloud solution, but one entirely free. There are a few limitations on the number of emails you can send, on the number of users you can have, and on autonomously uploading contact lists (which I will discuss later on). However, it is free and still benefits from the software team’s configuration. In a nutshell, you can have a free but performing solution with some minor limitations. Finally, the third and most complex solution is Self Hosted. It is downloaded and installed on your own server, and it is completely free. It is certainly harder to manage, as optimization and maintenance are your responsibility, and it requires a few technical competences. Many people are not fond of Open Source (OS) softwares, probably because they lack familiarity. I have been exclusively installing Linux operative systems since 2000 and I love OS softwares. I appreciate the freedom they give you. I love the freedom to customize and choose what I install on my computers. I love to be able to change it any time, with no effort, while preserving all my data. I also value choosing how much money to spend, and spending it on a transparent product. I especially enjoy user-friendly, stable and stress-free softwares, easy to fix either by myself or by paying a technician if I need to. Last but not least, I like the idea of a large community ready to step in and offer its help when you need it, both for free or for a fee (because Open Source is not synonymous with free of charge). Mautic can be elementary to use and you do not have to install it directly. All you have to do is create an account on mautic.net in order to access its Cloud version. You can choose between two options: one is free (and will always be free, as advertised on the website), and the other is subscription-based. The quote for the Pro option is personalized, based on the requested services. In general, you can expect the costs for a small- or medium-sized business to be trivial. You request a quote and wait for Mautic’s service to answer with a personalized proposal. In order to calibrate their offer they usually ask for information such as the company size, reasons for using Mautic, the business’ market area, number of employees and marketing-devoted personnel, current number of contacts, and prospective number of emails sent per day/month. Both solutions offer a completely equivalent software. The only significant limitation to the free version is due to anti-spam efforts, and prevents users from uploading pre-existing contact lists (CVS format). You are just discovering MA and you want to understand if it is what you need.You have a small marketing project, under 5000 contacts.You own a small business or you are a freelancer who cannot allocate significant resources, both in terms of money and/or labour time. Already have a structured MA plan.Want to start off on a highly professional level.Allocated a team and resources to the MA. The Self Hosted solution is a little different. It offers several benefits and a few drawbacks. The next paragraph should help you understand them in order to make an informed choice. Employ a web platform expert member on staff.Have access to a high quality internet connection.Can reserve a static IP address to the platform (not necessary, but recommended). Installing Mautic is not very complicated in itself. You can successfully install it in a few steps I will describe later on in a dedicated chapter. However, managing the basic requirements can become tricky, especially the PHP ones. If you know what I am talking about, then you will have no problem. If you are not familiar with PHP language, instead, your only chance is visiting mautic.org where you can copy the software requirements and send them to your hosting provider. Explain that you want to install Mautic, and find out which web hosting plan supports it, what they suggest, and why. The Mautic platform is quickly expanding and several hosting providers have tested it. Here below you can see the PHP configuration I use for my installations. Always refer to Mautic’s basic requirements, as they may change with the evolution of the platform. The settings in the image refer to Mautic version 2.9. (Fig. 1.1)My PHP configuration when installing Mautic 2.9 on my computers. Moreover, Mautic needs to manage some Cron Jobs. Once again, it is possible to either ask your web provider to set them up, or verify if you could do it yourself. Providers usually even include this service in their economy packages. All you have to do is access Mautic’s online manual at the section Cron Jobs. Always refer to the latest guide version, which represents the most updated official source of information. If your hosting provider uses cPanel it is possible you have Softaculous, an automatic software installer. If this is the case, you are all set as the installation process is automatic. However, all the previously discussed requirements will remain your responsibility, as Softaculous will not double check them. After having verified the basic requirements, you will be able to install Mautic by accessing the dedicated cPanel section. It should be called Softwares, the last one at the bottom of the page. Select Mautic in the More category. Enter installation credentials (folder, admin name, password, and not much else), set up a backup cycle, wait a little processing time and you are done. You are on Mautic! It will take less than ten minutes.